for children who are deaf and hard of hearing and their families? Order yours by clicking here ! This book is edited my my friend Warren Estabrooks, a legend in the field of AV practice. The chapters are written by friends and colleagues of mine. It's release is bittersweet as I would have too liked to have potentially liked to have helped authored a chapter but, back when the book was being written our family was reeling from a dramatic and unexpected death at the same time as my sister-in-law was battling cancer. Family always comes first! "Exciting advances in early detection of hearing loss, state-of-the art hearing technologies and the evolution of family-centered practices are helping children who are deaf or hard of hearing to have greater access than ever before to all the sounds of life. Today, through auditory-verbal practice, professionals and families work in collaboration to help children who are deaf or hard of hearing to take advantage of unprecedented opportunities to develop listening, spoken language and cognitive skills. 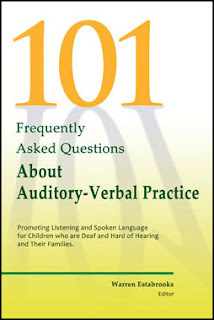 In 101 FAQs About Auditory-Verbal Practice, an exciting new addition to the literature, renowned experts in the field of auditory-verbal practice provide up-to-date information for everyone in the child's life – speech-language pathologists, audiologist, teacher, early intervention professionals doctors, school administrators and parents. 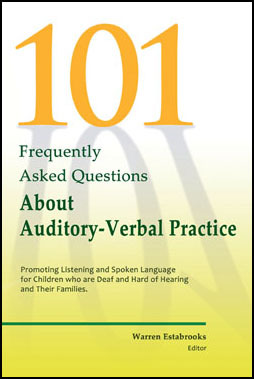 101 FAQs About Auditory-Verbal Practice takes the reader on a journey through current theory, practice, and evidence-based outcomes and offers knowledge, guidance, encouragement and hope for future generations of children who are deaf or hard of hearing, their families and the professionals who are honored to be part of their lives. Considerations for children with sequential/bilateral cochlear implants and those with multiple disabilities"